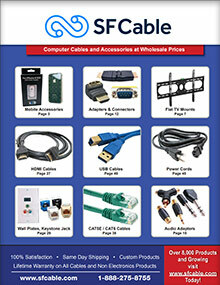 SF Cable catalog is your one stop shop for the best cables, components and accessories for all of your computer and consumer electronic product needs with hot coupon code savings. Enter the Coupon Code - SFCATALOG - at checkout on the SF Cable website. Cables - Keep your machine cabled and connected with premium computer cables that are compatible with any PC or MAC. Stock up on the best HDMI cables, DVI and display port options, cables for your home theater or stereo, keyboards, modems and mice, telephones, firewire and more. From the best Ethernet cable to internal power options, you'll be sure to find the perfect match. Shop conveniently by category, type, connector, color, length or price, with endless options to suit any device and any budget. Adapters & Connectors - Besides equipping you with the best cables at the best wholesale prices, SF Cable also features almost 600 different adapters, connectors and gender changers that are guaranteed to meet your computer, networking and audio video needs. You'll find audio and video adapters, couplers and connectors as well as computer and serial adapters, fiber adapters and media converters, USB adapters and an extensive assortment of male and female options available in black, white, beige, or metal, at lengths from 6" to 3 and a quarter feet. HDMI - Get the most out of your high-definition multimedia interface with a vast selection of HDMI friendly adapters and accessories designed to accommodate all of your audio video transmissions between digital televisions, disc players, computers, smartphones, cameras, video game consoles, stereos and more. Browse the best HDMI cables, adapters, splitters and extenders, switches, converters, wall plates, and more products that will help you achieve high quality, high speed, and high definition signals. Accessories - Accessorize your computers, cameras, cell phones, mp3 players and just about any electronic gadget under the sun with a wide selection of coordinating accessories ranging from power supplies and batteries to mice, monitors, and more. You'll find mobile accessories for smartphones and iPads, cable management gear, keyboards and webcams, CD and DVD cases, CPU and hard drive cooling products, bulk wire, I/O cards, network tools and testers, and every electronic essential on your list. For over a decade, SF Cable has serves as a one stop shop for high quality cables, components, home theater products, laptop and security accessories, featuring affordable solutions to keep you connected.